A bunion is a deformity of the big toe involving a bony enlargement of the joint. Bunions are believed to have a hereditary component, but they can also be caused by ill-fitting shoes, foot trauma, arthritis, and disease. They are surprisingly common — affecting up to 55% of women in the U.S., according to the American Orthopaedic Foot and Ankle Society. If conventional bunion aid products have not helped your shoe fit, you may want to consider shoe stretching techniques or bunion surgery. Sometimes a bunion can be quite painful and require surgical intervention, but most people just deal with the unsightly lump. It can make shoe shopping a challenge, as most footwear will rub on a bunion. Yet, that doesn’t mean all new shoes have to hurt. There are a few ways for bunion sufferers to find relief. Backpacker Magazine recommends seeing a professional bootfitter certified by America’s Best Bootfitters to stretch out new boots that will accommodate bunions. They can fix tightly fitting ski or hiking boots for $50 to $75. The 20-minute meeting involves having precise measurements using a Brannock Device taken, receiving EZ Fit Custom Adaptable Insoles, marking the trouble spots, and stretching the boots using an Ultra Cam device. A professional bootfitter can help you stretch shoes to accommodate a bunion. Buy Your Own Shoe Stretching Equipment. A more frugal option over the long haul is to try your hand at stretching your own boots and shoes to fit your bunion. First, buy a shoe stretching spray and coat the product to make the material more flexible. Then use a Foot Fitter stretching device to expand the shape of your footwear. This solution will cost you $50 or less, and can be used on as many pairs of shoes as you can buy. If your shoes almost fit and are made of natural materials like suede or leather, then you will have the best luck stretching your own shoes. 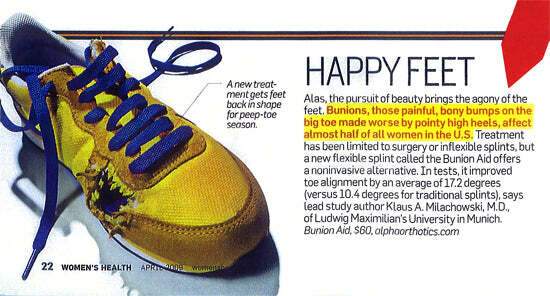 Search for bunion-friendly shoes at The Walking Company or The Healthy Feet Store. When trying on shoes, look for a wide, roomy toe box and shoes that are rounded, rather than pointy. You may find that certain shoe types or brands require no stretching at all. Boot brands like Keen, Lowa, and Merrell tend to run wider in the toe area. Also, consider shoes with laces, which can be loosened up quite a bit for an adjustable fit. There is no point in buying shoes that feel uncomfortable. Some bunion sufferers buy their shoes one half or one full size up and use after-market insoles and padding to fill in the extra space around the heel. Finally had enough? You can speak with a New York podiatrist about your options for correcting bunions. Ideal candidates for bunion surgery usually have severe pain that limits everyday activities, chronic swelling that does not respond to anti-inflammatory medication, stiffness, and major deformity. There are many different procedures, including minimally invasive options. Complications like infection, pain, bunion recurrence, and nerve damage affect roughly 10% of patients, causing a drawn-out recovery. Most patients take pain relief medication for several days, and are able to drive again within a week. After several months, they are back in regular shoes again. Contact The Center for Podiatric Care and Sports Medicine in New York City to discuss your options.